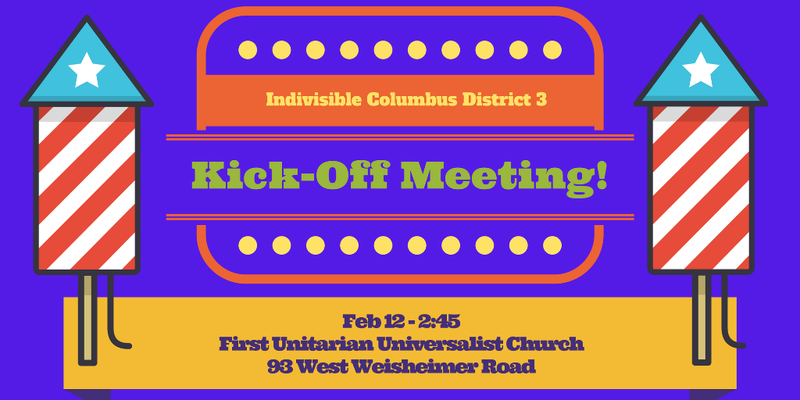 Welcome to Indivisible District 3! We are excited to be sharing our first e-newsletter with you. Feel free to share with any others who may be interested. Don’t Miss Our Kick-Off Meeting! If you haven’t yet registered, click here to go to our Eventbrite page to ensure your seat! 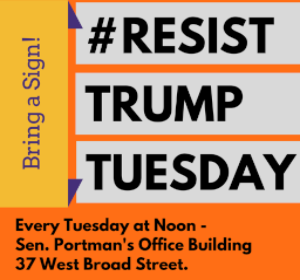 Resist Trump Tuesday – Join us tomorrow & every Tuesday to rally outside of Senator Portman’s downtown office. This week we will be demanding that Portman vote based on what’s best for Ohio, not for his pocketbook or party! Bring a sign! Do you want to visit Senator Portman’s office to have your voice heard? Click here to select a date and time using Signup Genius. SOCIAL MEDIA IS CRITICAL TO TRUMP RESISTANCE! Are you a member of District 3’s Facebook Group? That is the best way to stay up to date on calls to action and relevant news. Do you tweet? Follow us at @District3Cols and Meryl at @NoOrangeForMe. You should also follow Indivisible Columbus and the Indivisible Guide team. When you tweet, tag and/or use hashtags so that your tweets will be seen and retweeted. Hashtags to use are #Indivisible, #ResistTrumpTuesdays, #Resistance and #ResistTrump.